After a long day at the store shopping for everyone on your list, heading to the register can raise a few fears. The holidays can put a strain on your pocketbook, so you are particularly vulnerable when the clerk asks you if you want to save 20 percent on your purchase. As mentioned in a previous Lexington Law blog, store credit cards can cause significant damage to your credit score, so taking the time to learn about them is vital for your financial health. While saving some money now is pretty tempting, there is a downside to opening a new line of credit through a store. In addition, low credit limits are fairly common — usually around $1,000 — according to this Bankrate article. When a card has a lower limit, there is a more substantial chance that you will run a higher balance, which can ultimately hurt your credit score. Typically, you want to keep your statement balances under 30 percent of the overall limit. When limits are low, this is more difficult. If you decide to open a store credit card, make sure you are aware of the limit and, more specifically, what 30 percent of that limit is. There may be damage to your credit score by simply applying for a new credit card. It can cost anywhere between 10 and 30 points for the hard inquiry on your credit report. These can stay on your report for as long as two years. “You’re going to see more than a 30 point ding if you start getting multiple cards,” said Andy Jolls, CEO of VideoCreditScore.com and former executive at myFICO.com, reported Bankrate. The Simple Dollar noted that credit cards offered through stores often have very small monthly payment minimums. While this might seem appealing, it can turn into a trap. You may wind up paying substantial interest. For example, if you spend $200 on holiday presents, your first minimum payment might only be $5. If you decide to pay the minimum of $5 each month, you may wind up not paying off your entire debt for another 50 years. In addition, the interest is building up, so you wind up paying even more than the purchase price of your holiday gifts. For this reason, it is critical that you as a card user diligently pay off the entire credit card bill, otherwise you will wind up paying off unwanted credit card debt. 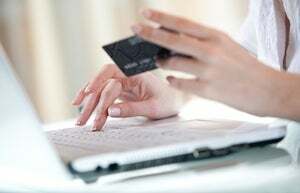 Bankrate also pointed out that signing up for a store credit card makes spending money much easier. Coupons, offers and the power of plastic in your hand may cause more painful bills with ridiculously high interest rates. “Once you sign up for a store card, you give the store free reign to bombard you with enticing ads and shopping promotions,” said Fatima Mehdikarimi, founder of ShoppingQueen.com. Some store credit cards offer additional perks that will make spending easier. For example, you may only need your phone number or account number to make purchases online. This also puts you at a higher risk for identity theft. While a store clerk may express the savings associated with having a card, it may not be worth the trouble. If you want access to the sales and coupons, consider asking to sign up for the store’s email newsletter instead. You may get the same deals you would get with the credit card, without the high interest rates and temptation. Protect your credit score and find alternative ways to save money during the holidays. U.S. News & World Report suggested a few great ways to save money this season, even if you’ve put off shopping to the last minute. The Internet is a great tool for comparing prices and finding the best deal. Doing your shopping online also eliminates some of the temptation for impulse buying. In addition, you can easily use coupon or promo codes to save some dough on your various purchases. Invest in a personal gift. Personalized gifts are some of the most cherished. Instead of spending a great deal of money, do something sentimental like writing a note, giving a Groupon deal or signing the recipient up for a membership. After the holidays, there will likely be a great deal of sales for off-season merchandise. Stock up on these items to save yourself the hassle next year. Check out winter clothing, holiday-themed decor and other items that stores need to sell to make room for new merchandise. Give yourself time to plan a budget, save up money, and shop around for the best deals. Protect yourself against this in the future by making your plan for next year today.